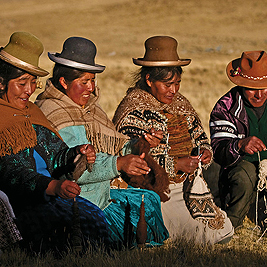 Indigenous peoples have a profound spiritual connection to their lands and resources. Yet, increasingly, indigenous persons are migrating within their countries and across international borders. This year’s commemoration of the International Day of the World’s Indigenous Peoples focused on Indigenous Peoples: Migration and Movement. The event explored how migration is an opportunity, but also carries inherent risks. Many indigenous migrants find themselves living in unsafe and insanitary conditions in urban areas. Indigenous women and girls experience disproportionately high rates of trafficking and other forms of violence and indigenous youth are faced with complex questions regarding their identity and values. Rosa Montezuma, the first young indigenous woman to hold the title of “Miss Panama 2018” spoke at the event, emphasizing that indigenous women are capable, talented, professional and determined to fight for their culture, identity and rights. Panelists also highlighted the need to address the root causes of migration, which includes loss of lands and livelihoods, displacement, dispossession, conservation and climate change, so that indigenous peoples can continue to live in their traditional lands and territories. In the Global Compact for Safe, Orderly and Regular Migration to be adopted in December, there is a call for continued protection of the rights and identities of indigenous peoples. “The Global Compact presents an excellent opportunity to highlight the specific needs and rights of migrants from indigenous groups, to address the risks and challenges they face in their countries of origin, transit and/or destination,” said UN DESA’s Under-Secretary-General Liu Zhenmin.